Julie Lavoie is a young artist from Montreal, Canada. She graduated from Mathematics at the University of Waterloo and now lives in Asia. "Bangkok is a city of invaders. Almost no one is from here. Everyone has come for their own reasons: the taxi drivers, the food vendors, the farang, the money boys, even the elephants. The young, the desperate, the ambitious -- all of us have come to the city as the place of our hope and our desire, part of the greater currents of urbanization and globalization in 21st century Asia. 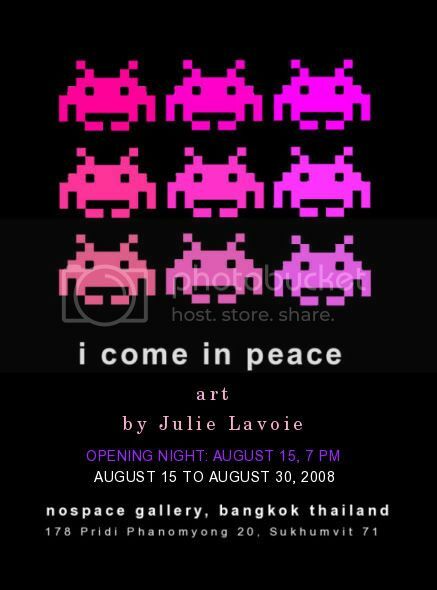 I used the playful yet iconic figure of the space invader to convey this sense of being an outsider wanting to make your mark in a new world, wanting to invade with your own style, having everyone pay attention, not being lost in the crowd."